These whole wheat oatmeal raisin cookies are soft and chewy and are just as, if not more delicious, than the traditional version! If you don’t have whole wheat on hand, these can be made with all-purpose flour. I’ve also made these as gluten-free oatmeal cookies, which are just as delicious! Looking at this recipe in the summer when it’s too hot to bake? Try these no-bake oatmeal cookies! They’re SO good. :D They’re also 100% whole grain and naturally gluten-free + vegan. I know that oatmeal raisin cookies aren’t all that exciting for most people. But they’re so homey. And they make me think of school lunches, visits with grandparents, and baking with my mother. People are stuffing all kinds of sweets into other sweets these days, and although I’m not exactly against it, I really love simple traditional goodies. You know, the kind our grandmas made. Today I was going through my recipe index and realized that I only have one such recipe: banana bread. No chocolate chip cookies, blueberry muffins, or chocolate brownies. All I’ve posted are more complex and, okay, more interesting versions of these. But sometimes I just want a plain brownie! I realize that almost everyone already has their favorite recipe for such baked goods, but do most people have favorite healthified versions which taste just as good as their white flour counterparts? Nope! At least I hope not because every now and then, I’m going to post some traditional favorites that have been given a little nutritional makeover. I hope you all won’t find this boring! This recipe substitutes coconut oil for butter, uses about half of the sugar a lot of recipes use, and is 100% whole grain. I used whole spelt, which I really prefer and recommend, but you can also use whole wheat. Regular whole wheat works as well as white whole wheat. 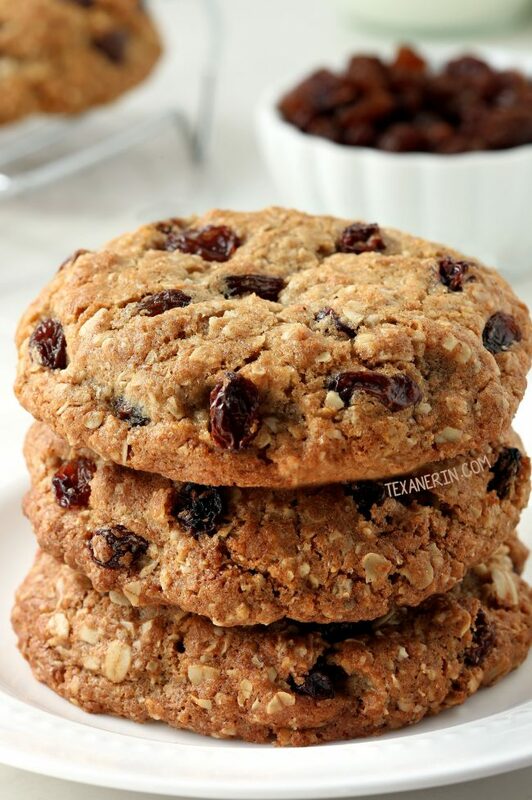 Whichever you choose, these oatmeal raisin cookies don’t taste the least bit whole grain! And even more important for me – the texture! These whole wheat oatmeal raisin cookies are SO thick and chewy. And they don’t have that slightly cakey feel that some healthy cookies have. At least if you don’t over bake them, which I did, thinking that they weren’t done. Are there any traditional favorites that you’d like a healthified version of? Let me know and I’ll see what I can do! Preheat the oven to 375°F (190°C) and line a cookie sheet with a piece of parchment paper. Stir together the dry ingredients in a medium mixing bowl and set aside. In a large mixing bowl, stir together the melted coconut oil, sugar, eggs, and vanilla and stir. Add the dry mix to the wet mix and stir just until combined. Stir in the oats and raisins, again stirring just until combined. Form the dough into 75-gram balls, about two inches or slightly over 1/4 cup in size, and place 4" apart on the prepared baking sheet. Press the balls down slightly with the palm of your hand. If your dough is too soft to roll into balls, refrigerate for about 30 minutes or until scoopable. Bake for 13-17 minutes or until the middle appears to be set and the cookies have evenly browned. Let cool completely on the baking sheet. Store in an airtight container up to 5 days. 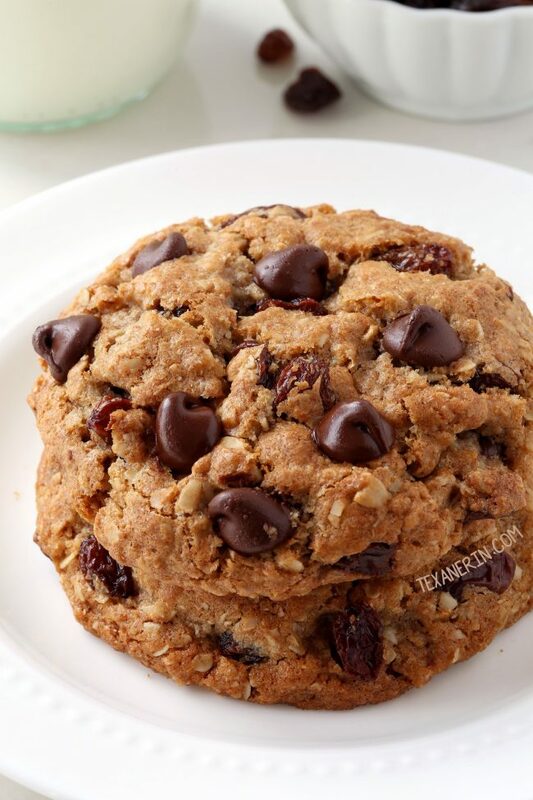 129 comments on “Whole Grain Chewy Oatmeal Raisin Cookies” — Add one! These are amazing!! I used refined coconut oil and really loved the taste. My family couldn’t tell that they were gluten free. That’s a win for me! Another great recipe! Thanks. My husband will love these oatmeal cookies after work today. I added raisins walnuts and chocolate chips. They stayed their shape and didn’t spread. I used 100%whole wheat flour. Sorry for just now seeing your comment! I hope that your husband enjoyed them. :) Walnuts sounds like a yummy addition! Thanks for your comment. I tried these tonight with chocolate-covered raisins, pecans and some chocolate chips. I can’t have cinnamon nor bake with it. These came out AMAZING! I bake for my boyfriend’s staff (3rd shift Alzheimers unit nurses) and they raved as well. Your comments and suggestions are right on- signs of an experienced baker. Need to browse the rest of your page now! I baked them. They were delicious! they just turned out to be too sweet for my taste, even though I only used about two thirds of the amount of sugar in the recipe! The next time I will be using only one sixth of the recipe amount. I also think that the cookies were too large with 75 gram scoops, so I am going to make each of them about 20 grams, from now on! These cookies are delicious!!! I think I have made them at least 20 times in the past 6 months, sometimes even doubling the recipe! I had to go dairy, soy and chocolate free due to my nursing babies food intolerances and saying I’m a “dessert person” is an understatement. I had been making them with whole wheat sprouted flour and cooking them 9 to 10 minutes, but I just made them with sprouted spelt flour for the first time and cooked them 12 minutes and they are even better!! Thank you for sharing an amazing recipe! I just tried this recepie and I really liked it. I made some changes. I used the oats flour, like mentioned before and the texture is great. I used coconut sugar and for my taste they are quite sweet, you could go for less sugar, specially if using raisins ( I didn’t). Instead, I mixed cacao nibs and pecans and they give a great mild nutty chocolate flavor. Definitely a great recipe and I know I’ll improve it next time. Thank you for sharing!!! Love it! Delicious! I didn’t need to bake them that long, about 11 minutes. Also I frosted mine with powder sugar (cream and vanilla) frosting. Thanks for the great recipe. I have been making these cookies for 4 years! They never disappoint. Thanks again for such a killer recipe, Erin. I’m a new mama and I just read the comment above about using all oats/flax seed and I’m going to give that a go next time. Thanks for the great recipe, Erin! These are my go-to lactation and eat-on-the-go-with-kids cookies. I’ve been using oat flour (just ground up old fashioned oats) instead of whole wheat, and they work wonderfully. I usually make them with chocolate chips and walnuts. I use 1 1/2 cups of oat flour (measured after it’s ground, just like wheat flour). Recently, I’ve also tried 1 cup of oat flour and 1/2 cup of ground flaxseed. Again, they work great…it’s a super forgiving recipe! If you use chia, use eggs too?? I think that person used the ground flaxseed in place of 1/2 cup of the flour. So you would still need the eggs.